With hardly any effort and in less than half an hour, you can be enjoying this soft flaky fish on a bed of tender potatoes, thanks to our Panasonic Steam Combi Microwave. Peel and cut the potatoes into thin slices. Layer the potatoes in the dish with the garlic. Sprinkle the tomatoes and pine nuts over the potato. 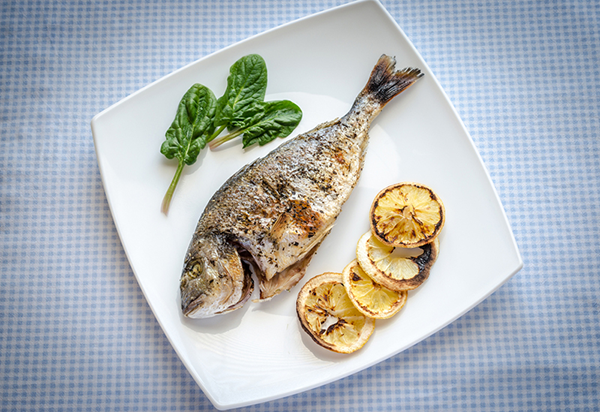 Score the sea bream through the flesh down to the bone. Season and rub with olive oil and scatter with coriander. Place the fish on top of the potatoes and brush with some of the oil from the sundried tomatoes. Cook on CONVECTION 220º C + LOW MICROWAVE for 15mins or until fish flakes easily off the bone.